Do you use your heat pump to cool your home in the summer? Well, you'll be glad to hear that using air conditioning doesn't mean your summer energy bill needs to go through the roof! We've put together some energy saving tips to help you stay cool this summer. Summer is a great time to prepare your air conditioning for use in the warmer months, especially if you've used it heavily to heat your home over winter. Each month, it pays to check the air filters. During summer, in particular, there's a lot of plant matter in the air that will be carried into your home on shoes, clothes and animals. This can clog up your filters faster than you think, meaning your unit will have to work harder to keep your home cool. Make sure plants, debris and shrubbery aren't too close to the outside unit. The steady flow of air through the unit is essential to making it work. Make sure the outdoor unit is in a cool, dry place, because the hotter the outdoor unit gets, the harder it works to pump cool air into your home. Using the right heat pump settings for summer is essential if you want to effectively cool your home without breaking the bank. For maximum efficiency, set your thermostat to between 20C – 22C. Your home won't cool down any quicker if you set the temperature lower, but your unit will work a lot harder – meaning you'll be using a lot more power. Maintain a steady thermostat setting and turn the pump off when it is not required for extended periods of time. You can also use of a timer or app controlled device to turn it back on so that the room is cooled for your arrival. Sometimes the heat isn't the problem, it's the humidity. If you have a dehumidifier setting on your heat pump, try turning it on for half an hour to dry out the air. This can make a big difference to how cool your home feels. If you have a ducted central heating or cooling system in your home, make sure that the vents are all open. It may sound counter-intuitive, but if you have closed vents, your air conditioner will have to work harder to keep the air cool, which can push up your energy bill. Cooling your home works in the same way as heating it but in reverse – you want to keep the cool air in! Close windows and doors, and pull down blinds or close curtains if you have the sun streaming in. If you're at home on your own, close off the area you're cooling so your air conditioning isn't working to cool down rooms you're not using. Think about your appliances too. If you have a big meal to cook, close the kitchen off from the area you're cooling down. Don't leave computers or televisions turned on if no one's using them, as these items generate a lot of heat. Close the bathroom door if someone's having a shower, and leave it closed (with the window open) while the room cools down again afterwards. Bathrooms don't just get hot, they get humid too – which is hard for your air conditioning to deal with. Remember that good quality insulation doesn't just keep your home warmer during the winter; it keeps it cooler during the summer, too. If you haven't already, consider insulating at least the floor and ceiling of your home. Oh, and if you're trying to stay cool, it's probably best to not be wrapped up in slippers and layers of clothes at the same time. No amount of air conditioning will help if you insist on wearing woollies in the summer! Prefer to avoid using the air conditioner? If you don't want to crank up the air con this summer, you could always go DIY. Use a fan instead of the heat pump. Alternatively, most heat pumps or air conditioning units have a ‘fan only' setting, which will do the same thing. Try to have at least a couple of windows open during the day to create airflow. This will help keep the house cool and dry. Fitting flyscreens/security screens to doors or windows is also a great way to keep the house cool, while keeping insects out and small children and pets in. Whether you're using air conditioning, blinds, curtains or outdoor awnings they are effective ways of keeping out the heat. Think about your appliances and what you're doing in your home. Showering, cooking and using computers, televisions or vacuum cleaners will all add heat and humidity to the air in your home. Finally, make sure you're on the right energy plan for your home. Find the right plan for you and your family here. 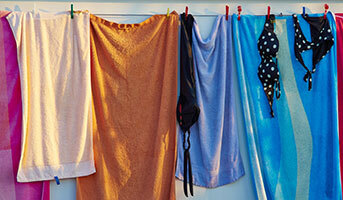 Check out our tips on saving energy at your bach or crib this summer – and at home too.